A pilonidal cyst develops near the tailbone or top of the buttocks crease. It may look like a small depression or a pit. Sometimes, it may have a hollow tunnel or tract that connects it to the exterior of the skin. Usually, a pilonidal cyst does not cause any symptoms. But, when it becomes infected, it may cause pain, itching, and inflammation. 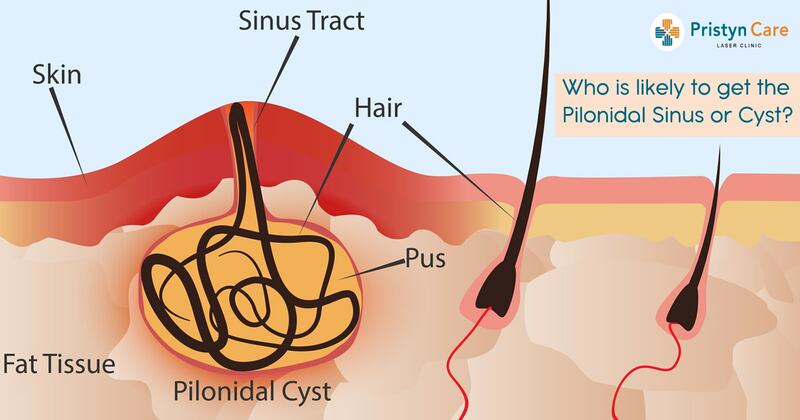 There is no specific reason, but males are more prone to develop a pilonidal cyst. Pilonidal cysts are most common in males in their late teens or early 20s. Having a body mass index (BMI) of 30 or more may encourage the development of a pilonidal cyst. People who sit for a long duration of time in a position have a greater chance of developing pilonidal cysts. The continuous contact between the chair and the buttock cleft exerts pressure and increases the probability of getting a pilonidal cyst. People having a job that involves a lot of driving or sitting down for long periods are more likely to develop a Pilonidal cyst. Approximately, one-third of people have a family member with the condition. People with an above average amount of body hair are more likely to get a pilonidal cyst, which may be why more men are affected than women. People who have coarse and curly body hair are more likely to get a pilonidal cyst. Having a deep cleft between your buttocks can also increase the chances of getting the problem. Hygiene plays a very important role in developing as well as in controlling the pilonidal cyst. Any previous injury to the affected area of skin may be a cause of getting a pilonidal cyst.